A Londonderry man has claimed that republican vigilantes told him to go to anger management classes or get shot. The Republican Actions Against Drugs (RAAD) has been behind paramilitary-style shootings against those guilty of so-called "anti-social behaviour". But Hugh Brady, a community volunteer, said he was surprised by the claim. He had never heard about anyone being ordered to go on an anger management course by RAAD, he said. Mr Brady is a volunteer adviser at the Rosemount Resource Centre which acts as an intermediary between RAAD and those threatened by the group. He said: "I think this young man is being quite cynical,"
The man, who did not give his name, said he had been threatened by RAAD. "They said they would shoot me because I got the blame for stealing a car," the man said. "I had to do a course like an anger management couse." "It was down behind Rosemount Centre." 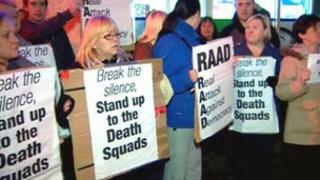 The man said that RAAD ruled his area of Derry and people were afraid to speak out. "They are gangsters and bullies," he claimed. Derry journalist Eamon McDermott said it was the first time he had heard of RAAD anger management classes. "They were concerning themselves with drugs but in recent times they have been dealing with what they would class as anti-social activity." Mr McDermott said the vigilantes had a certain amount of tacit support within the community. "They are prepared to turn blind eyes basically because they see the police not dealing with the behaviour, they see a vacuum, and anyone seen to be dealing with drug pushers or dealers are not going to be very unpopular." Mr McDermott said the only way for the PSNI to deal with this was to go into areas where they still face a legacy of mistrust. This was a major obstacle for police, he said. The mother of a drug user who was targeted by the group, described how her son was shot in the legs in a so-called punishment shooting. "It had to be done", she said, "if it hadn't the consequences would have been worse". In March, A father has described how his 20-year-old son was shot in front of him in a Londonderry street. Kieran McFadden's son, also Kieran, was shot in the leg in the Bogside on Wednesday night. A cousin was shot in both legs. The group Republican Action Against Drugs (RAAD) carried out the attack.